Oliphaunt is a poem by J.R.R. Tolkien which was first published in The Lord of the Rings, Book IV, Chapter 3, and reprinted with the title Oliphaunt in The Adventures of Tom Bombadil and Other Verses from the Red Book (1962). It was also reprinted in a children illustrated book edition called Oliphaunt (Beastly Verse) in August 1989 by Contemporary Books. It is now long out of print and has now been announced to be released as a limited edition poster. This limited edition poster reproduces the poem ‘Oliphaunt’ from The Lord of the Rings and has been produced by traditional methods on a letter-press using metal type to print the poem and woodblock type to blind emboss the title of the work. Printed on specially imported paper, the poster is limited to just 100 copies worldwide. It must have been October 2008 when I was contacted by Richard Ardagh, who had seen the limited edition poster of Oliphaunt by the Eden press availabe here at Tolkienlibrary.com. He contacted me to ask how he could obtain permission to produce a poster of Oliphaunt. Excited by his designs I gave him some contact details and it seems now that he succeeded in getting his poster being published by Harper Collins! Much to my excitement! I'm a fan of Tolkien, a fan of typography and fonts... so this is a must have item for me!! This letterpress poster is one of a limited printing of 100 copies, which have been printed and numbered by hand by the designer, Richard Ardagh, and Graham Bignell at New North Press. 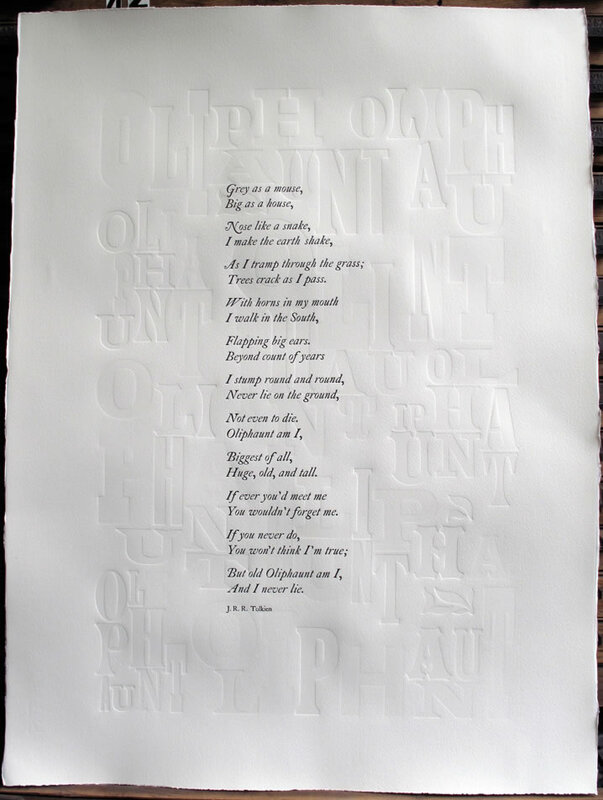 The poster reproduces the poem, "Oliphaunt", as recited by Sam the Hobbit in Book IV, Chapter 3 of The Lord of the Rings by J.R.R. Tolkien. It is an old fireside rhyme of the Shire that describes a legendary beast used by Men out of the South, who build houses and towers upon its back. The type of the poster has been set by hand in two sections: metal type for the poem itself and a wooden type collage for the unprinted impression of the repeated title. Both sections are printed on an Albion Press on pre-damped Moulin du Glue paper. The metal type is printed first and paper kept damp while the ink dries. The following day the wooden type is 'blind embossed' or pulled without ink and placed on the drying rack. The printing is strictly limited to a run of 100 posters which are for sale worldwide; there will be no further copies produced. Each poster is supplied loosely rolled in its own triangular shipping tube and is accompanied by a Certificate of Authenticity signed by the designer, Richard Ardagh, and features the corresponding number of limitation. It is a truly unique item that will form an elegant part of any collection; once framed, it will prove a talking point and treasured heirloom for many years to come. (by the way - if you want to learn some more about the artist Richard Ardagh, click on the image below to the right and read an interview he did with ES magazine). Looking at Richard Ardagh's other Letterpress posters the Oliphaunt print will be roughly 75 x 55cm, hand-set type printed on heavy art paper and will probably be an edition of between 50 and 100 only. Since I don't have any photographs of the poster yet I show you here another from the artist, called Oranges & Lemons. Elephants' Graveyard is the portfolio of Richard Ardagh, showcasing the work of his London-based design studio. After graduating from Central St Martins in 2003, Ardagh cut his teeth designing for clients such as The Zetter and Hayward Gallery while working under Fabian Monheim, and in 2006 founded his own studio. Projects to date have called for the design of logos, bars, books, exhibitions, packaging and freak shows. This multifarious approach has charmed clients including Paul Smith and Vauxhall, as well as a number of start-up ventures such as Max Fraser's London Design Guide. Aside from commercial projects, Ardagh also works with New North Press to produce hand-printed letterpress editions. 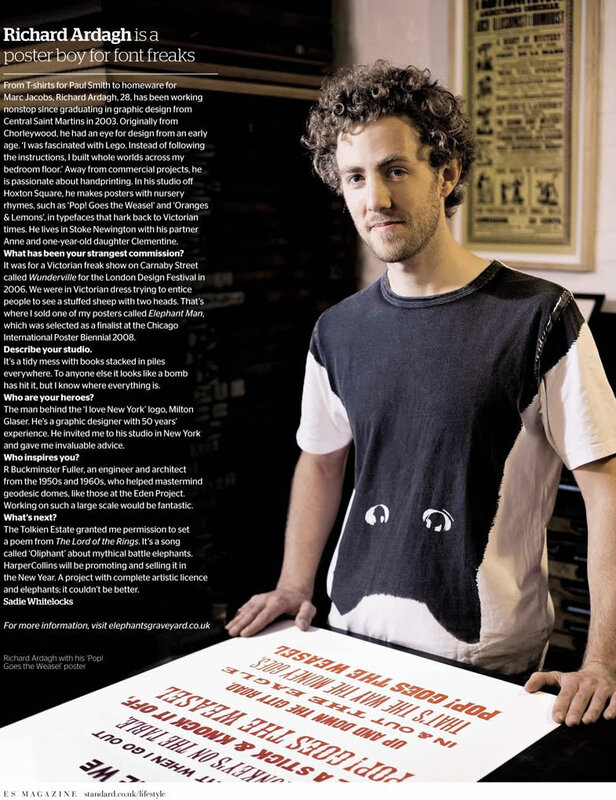 This partnership follows the success of his Elephant Man poster which was selected as a finalist in the Chicago International Poster Biennial 2008. Their latest collaboration, Oliphaunt – a verse from The Lord of The Rings by J.R.R. Tolkien – will be available from Harper Collins from spring 2010.